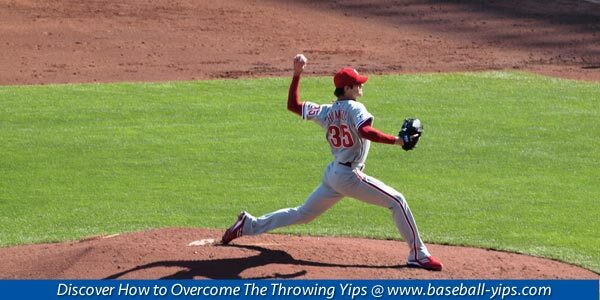 You are here: Home / Baseball Yips Articles / Why Do The Yips Only Come in Games? Why Do The Yips Only Come in Games? Can You Throw Freely in Games? One big sign you have the throwing yips is when you can throw freely in practice or BP and lose control of your throwing action in games. So you can practice your throwing in warm up or the bullpen easily with full control, but why does your throwing control change when your get on the mound in a game situation? You obviously change your approach when you are on the mound in a game. But why would that cause you to have the yips in a game situation? Most players feel more pressure to perform in a game situation. Most of this pressure comes in the form of worry, worrying about what coach and teammates think or worry about letting down a parent with a poor outing. The pressure baseball pitchers feel often often goes undetected from their conscious mind. They don’t know what prevents them from pitching freely. In the vast number of throwing yips cases in baseball, the fear and pressure comes from social approval or not wanting to feel embarrassed. Or wanting to look like the star of the game. Both of these are the same issue just two different spectrum: One player badly wants to perform well and they other fears messing up and what others will think. This is the reason the throwing yips shows up in games only–for the most part. Some players start to tighten up in their warm up or when throwing BP. The pressure to succeed and everything that comes with that pressure leads to phenomenon of over control. 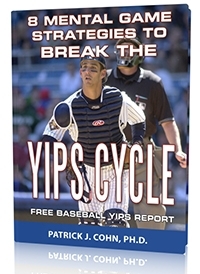 I call this the yips cycle. When you fear the outcome, you try hard to have a good performance. When you try hard to perform well, you try to be more perfect, which leads to over control of your throwing action. This over control eventually leads you to feel like you are out of control on the mound because you can’t hit your spots. In order to take your practice game to the mound, you have to uncover the real issues that cause you to tighten up and over control your action. Working one-on-one with a trained mental coach with experience with the throwing yips can help you uncover the underlying issues, as you will not find a specific physical technique to solve this problem. 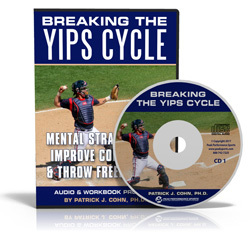 Download Our FREE Baseball Throwing Yips Report! 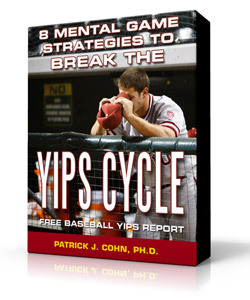 Beat The Yips With Expert Mental Game Coaching!